Dental veneers provide a cover to an affected tooth or teeth. We use porcelain because this material has proven to be resistant to stains, extremely durable, and highly aesthetic, looking very much like natural enamel. 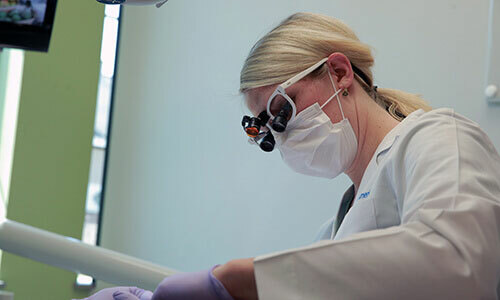 The dental laboratory with which Dr. Angie works offers several choices in porcelain, allowing our patients to attain their most naturally attractive smiles. Lumineers provide a nice alternative to traditional porcelain veneers for those who would like to forgo the preparatory steps in this cosmetic procedure. Like porcelain veneers, Lumineers effectively mask teeth that are discolored, crooked, misshapen, or otherwise cosmetically impaired. When the overall results are the same, why choose Lumineers over traditional veneers? Lumineers are ultra-thin, which allows each shell to be placed without the need for enamel removal. What this means for the patient is no drilling and no lifetime commitment to cosmetic treatment. Because all surface enamel is left intact with Lumineers, they can be removed at any time without consequence. If you do not love what you see when you smile at yourself in the mirror, porcelain veneers may be the ideal form of cosmetic treatment to perfect your smile. Contact us to learn more about porcelain veneers and Lumineers, and to see which option is most suitable to achieve your aesthetic goals.